Alfred Hitchcock engulfs you in a whirlpool of terror and tension! Set in San Francisco, James Stewart portrays an acrophobic detective hired to trail a friend's suicidal wife (Novak). After he successfully rescues her from a leap into the bay, he finds himself becoming obsessed with the beautifully troubled woman. One of cinema's most chillingly romantic endeavors: it's a fascinating myriad of haunting camera angles shot among some of San Francisco's reowned landmarks. This film is a must for collectors; Leonard Maltin gives Vertigo four stars and hails it as "A genuinely great motion picture that demands multiple viewings." 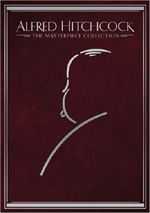 Available Only as Part of Alfred Hitchcock: The Masterpiece Collection. For a reviewer, I think only one task is more difficult than averring one's love for a much-disliked film: proclaiming one's disaffection for a movie strongly seen as a classic. I don't wanna do it, but I gotta say it: I don't get the fantastic critical love for Vertigo. Right off the bat, let me make this clear: I think it's a good movie. I also think it's one that probably will open up additional layers upon repeated viewings, so I definitely reserve the right to alter my opinion at a later time. Right now, however, I must say that I found it interesting but frequently slow and dull. As with most Hitchcock films, what we initially think the film will be about is not what Vertigo ultimately addresses. Vertigo largely concerns the destructive nature of obsession, particularly in the form of obsessive love. Scottie Ferguson (James Stewart) goes through life without much real human connection until he meets Madeline (Kim Novak), a blonde beauty who captures his affection and attention. What happens after that point shows the dangers of getting too concretely attached and of what happens when one pushes too hard for an unrealistic dream instead of enjoying what one has. Or something like that. Vertigo definitely is effective, but something about it simply leaves me flat. Maybe it's because the film wasn't really what I expected. While it has some of those moments, it's not a really thrilling chiller ala Psycho. That's not bad, but even though I'd seen Vertigo years ago, I wasn't quite prepared for the route it would take. As such, there is a good chance I'll better appreciate Vertigo in the future. Unfortunately, I have to write about how I feel right now, and that means that while Vertigo is a well-made film, it's not one that does much for me. Vertigo appears in an aspect ratio of approximately 1.85:1 on this single-sided, double-layered DVD; the image has been enhanced for 16X9 televisions. That differentiates it from the original 1998 DVD, which only offered a non-anamorphic presentation. The new transfer easily outdid the old one. Sharpness was generally good. Despite Hitchcock’s penchant for soft focus on his leading ladies, this flick usually looked nicely detailed and distinctive. Some edge haloes caused mild softness in some wide shots, but those instances weren’t excessive. No jagged edges or shimmering occurred. Source flaws caused a few distractions. Speckles, grit and spots cropped up on occasion. They varied in intensity, as some scenes got off with none while others could be moderately messy. They stayed unobtrusive most of the time, though. Colors often shined on this DVD and they were usually the best part of it. They could appear quite rich and lush and vibrant, as the photography demonstrated more than a few vibrant elements. Black levels appeared pretty good though inconsistent, and shadow detail also seemed largely appropriate but occasionally too opaque. Again, the filmmaking techniques may be mainly at fault; some "day for night" shooting appeared to have occurred, and those shots almost always looked too dark. I found the bell tower scenes to also seem overly dense, though. While the edge enhancement, minor print flaws and occasional softness created some issues, plenty of shots looked absolutely gorgeous. All of that made this an inconsistent but usually positive presentation worthy of a "B". How did this transfer improve on the visuals of the original DVD? It mostly tightened things up to a degree. Sharpness was the main beneficiary, as the new image looked crisper and more detailed. The other areas stayed about the same. Nonetheless, the improved definition made the new transfer substantially more impressive. The film's remixed Dolby Digital 5.1 soundtrack performed fine, but it also had some concerns. The soundstage wasn't terribly broad or deep, but it seemed just wide and involving enough to create a good effect. It's a very gentle, ambient mix for the most part, with only light sounds usually emanating from the front side or rear channels. Car noises were the most prominent effects we heard, and we even witnessed some solid panning between channels from them. Despite the non-aggressive nature of the mix, I found it to be quite satisfying. The quality of the audio was a bigger concern. Actually, it usually sounded very good – that was the problem. Due to the condition of the source material, some effects had to be re-recorded. Although I’ve been fine with some other movies that did this – I liked the remix for Jaws very much, in fact – I found the new foley work of Vertigo to come as a distraction. Those pieces didn’t mesh well with the rest of the track and they stood out from the rest of the mix. Dialogue occasionally betrayed a slightly harsh edge, but it sounded surprisingly natural and clear and always was easily intelligible. Bernard Herrmann's score really came to life here. The music lacked a little high range but still seemed smooth and packed some good low end. Only the distractions of the new effects gave me pause when I listened to this mix. Otherwise it was a solid affair. Whereas the original DVD only included this remix, this one also provided the movie’s monaural soundtrack. Place this one in the “be careful what you wish for category”. When the old disc hit the shelves, fans rightly complained that it lacked the original audio. We finally get that track here, but unfortunately, it’s rather flawed. Apparently no good source material remains, so this mix came from less-than-ideal elements. That showed as I listened to it. Speech tended to be edgy and brittle, while a lot of background noise and hiss appeared along the way. Other examples of distortion also occurred, and I noticed some crackling and various concerns. While I’m not wild about the 5.1 remix, it’s definitely better than this problematic mono track. One other audio note: while this disc included a 5.1 track, the original DVD featured 5.0 sound. To my ears, no substantial differences occurred between the two. Bass response was good for both, so the isolated LFE channel didn’t make a substantial change in either direction. A decent set of extras shows up here. First up is a running audio commentary from a number of participants. Mainly we hear from associate producer Herbert Coleman, who's paired with restoration team leaders Robert A. Harris and James C. Katz. In addition, comments come from co-screenwriter Samuel Taylor and Bernard Herrmann biographer Steven Smith as well as actor Kim Novak, art director Henry Bumstead, former Paramount director of advertising and publicity Herbert Steinberg, script supervisor Peggy Robertson, and Hitchcock’s daughter Pat. The variety of speakers necessitates a fair amount of editing, but it still flows smoothly. As one might expect, Taylor talks about the screenplay and his work on the film, while Smith goes into Herrmann’s career and his collaborations with Hitchcock. Novak tells us a little about what Vertigo means to her and also chats about her time on the flick. Bumstead and Steinberg discuss their impressions of Hitchcock, while Pat and Robertson present notes about his personal side as well. DVD producer Laurent Bourzereau tosses out one short comment about the production but otherwise solely acts as a narrator. Coleman, Harris and Katz offer the standard running, screen-specific chat into which the other remarks are interspersed. When I first listened to this commentary a few years back, I didn’t like it, but on second screening, it works much better than I recalled. Issues connected to the restoration fill a lot of the time, as we learn all the challenges faced by Harris and Katz. Coleman also digs into various production elements such as problems with the script, sets and locations, shooting specific scenes, casting, and general concerns. When I first listened to this commentary, I was hard on Coleman, as I thought he said little of use and didn’t seem to remember much. I was too tough on the guy. His memory slips at times, and this leads to some awkward moments where his thoughts conflict with the other guys’ research. Nonetheless, Coleman is honest and entertaining, and he gives us enough good info about the film to make his time worthwhile. This never becomes a great commentary, but it helps flesh out our knowledge of the flick. Next up is Obsessed With Vertigo: New Life for Hitchcock's Masterpiece, a 29-minute and 17-second documentary about the film. Well, sort of - the program also discusses the movie's restoration. Narrated by Roddy McDowall, we find interviews with participants, film clips and both production stills and behind the scenes footage; this is intercut with material about the restoration. In regard to the interviews, we hear from Katz, Harris, Coleman, Novak, Robertson, Bumstead, Taylor, Hitchcock’s daughter Pat, filmmaker Martin Scorsese, writer Maxwell Anderson, production manager CO “Doc” Erickson, June Van Dyke of the Edith Head Collection, and actor Barbara Bel Geddes. The participants get into Hitchcock’s desire to shoot a mystery set in San Francisco, developing the script, casting, locations and sets, costumes, score, and titles. As mentioned, we also get tidbits about the restoration. This isn't a bad program but it seems superficial and lacks the depth of the documentaries that accompany Psycho and The Birds. This show provides some good information but simply zips through its subjects too quickly and without enough depth. Vertigo contains a few other extras. Trailers for both the film's original release and for the restored movie's theatrical run appear. The disc also contains good production notes. The two-minute and nine-second Foreign Censorship Ending isn’t as exciting as its title might imply. It wraps things up with less ambiguity and makes the movie less effective. Still, it’s cool to see. Inside The Vertigo Archives, we find a mix of still materials. These include production design art, storyboards, production photos, marketing materials and text information. The latter replicate some of the information from the “Production Notes” elsewhere on the DVD, but they are significantly longer and more detailed. In all, this area features 409 frames of materials. Many are quite good; I especially like some of the publicity photos that feature Stewart and two Novaks, and the various Saul Bass poster concepts are cool. However, the interface bites. These elements were ported over straight from the old Vertigo LD and don’t allow easy access to the various areas. That means that to get to the text at the end, you have to step through hundreds of earlier images. How does this set’s extras differ from those on the earlier disc? Overall they’re similar, though this package loses cast and crew biographies. It makes little sense to me that these get cut, but they’re gone with or without my approval. Ultimately I found Vertigo to be a disappointment but - perhaps perversely - it's a disc I'll recommend. The movie didn't fascinate me as much as it obviously has others, but I liked it well enough to want to watch it again at some point. The DVD provides good picture, sound and supplements. Vertigo doesn't dazzle me as a movie or as a DVD, but it’s worth a look. It also offers a moderate upgrade for fans who already own the prior disc. They’ll be attracted to the improved transfer and the inclusion of the original monaural soundtrack, though I think it’s faulty and prefer the 5.1 remix. Folks who want the best-available version of Vertigo will go for this disc. 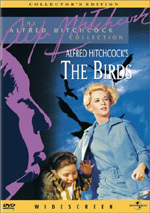 Note that this version of Vertigo appears only as part of the 15-DVD Alfred Hitchcock: The Masterpiece Collection. This massive release also includes Saboteur, Shadow of a Doubt, Rope, Rear Window, The Trouble With Harry, The Man Who Knew Too Much, Psycho, The Birds, Torn Curtain, Marnie, Topaz, Frenzy, Family Plot, and a disc of bonus materials. As of October 2005, when or if a solo version of this DVD will come out is currently unknown.